This work presents the facts of the Sanskrit language as they are used in literature and also as laid down by the grammarians. Forms and constructions as exhibited in the Vedas, the Brahmanas, the Epics and the Puranas are included. The treatment is consistent with the teachings of linguistic science. "Fresh, readable, and a treasure. I used this book at the University of Washington and it is as great as ever. 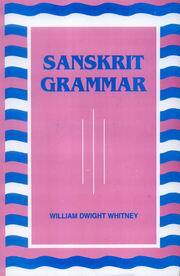 We have been using Whitney's Grammar in addition to Whitney's Roots and the Lanman Reader for the purposes of learning Sanskrit this year. Our professor teaches from a historical linguistic perspective for which this book is fairly well suited. This book is most remarkable for its extremely well organized format and exhaustive treatment of the forms. The inclusion of Vedic forms is very nice. The Sanskrit Reader by Charles R. Lanman is the perfect complement to this reference grammar. The excellent notes in Lanman's reader refer the student to Whitney's Grammar, the vocabulary is helpful and the stories are delightful. Whitney's Grammar is a must for a thorough grasp of the forms though."